The saying ‘having your life flash before your eyes’ when facing a near death experience is one we are familiar with, some will even call it cliché but nothing can ever prepare you for that moment when it eventually happens to you. 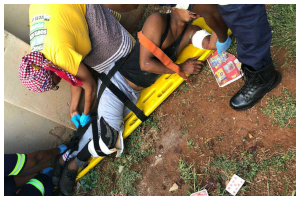 For Themba Nkuna this became a reality when what started out as an innocent game of cards with friends came to a catastrophic end when a taxi crashed into them – almost killing them. It was just a regular day for the 27-year-old father-of-one. “I was getting ready for training as I do every Wednesday around that time,” he tells Move!. “I remember changing into tights and wearing tracksuit pants over them as it was still a bit early for training,” he says. To pass time while waiting for his soccer practice to start the father of four-year-old Bokamoso Mjova went across the road from his house to be around some friends at a usual spot where they normally hang out as guys and play cards. In a round that consisted of five players, Themba stepped in as a replacement for his friend unaware that it would not be long before the game came to a detrimental end when a Toyota Quantum taxi came uncontrollably at the group. “The first thing we all heard was the sound of a raving engine, but that did not concern us that much because we are used to cars spinning in the neighborhood,” Themba explains. From the point on realizing what was coming towards them Themba says there was not enough time to react before the taxi was upon them. “I blacked out for a second and when I came too I remember just hearing the voice of my niece screaming. At that moment I knew what had happened but I was more focused on what was happening to my body and what I was feeling” he explains as he exposes his legs from under the hospital blankets and points to his right leg which was the least injured from the crash. Across the road at Themba’s house the wreckage sound of the crash was heard by his older sister, Nomsa Nkuna (35) who was in the house. “When I heard the sound of the crash I immediately went outside to see what was going on and as I came outside the door I heard my daughter screaming and that got to me a bit as I thought she was the one who was hit by the car” she says. Proceeding outside Nomsa realized that it was her brother who had been involved in the accident and she immediately proceeded to the scene to see what was happening. “When I got to him he was bleeding on his legs, he had bruises on his face and he also had blood coming out of his nose” she says. Waiting on the ambulance to arrive she tells us how her brother started getting erratic, “He was scared because he thought he was dying. I had to do my best to get him to calm down because he was restless. He starting saying his body was feeling cold and then he said he was thirty and that he wanted water” at this stage Nomsa says she was sent into a panic of her own which almost sent her into early labour. “I tried comforting him but I also started panicking, taking in the full magnitude of what had happen, which was not good for my pregnancy. I almost went into early labour” she says. Out of the four guys who were playing cards with Themba, three managed to escape with no serious injuries. It was just him and his friend Thokozani Khumalo (29) who sustained injuries that landed them in the hospital. “I think he was trying to do a handbrake turn because for a second the taxi drifted until it was on the two wheels of its right side” he tells us. “It started looking like it was falling that’s when I think he tried to bring it back down, but when the other wheels touched down that’s when he lost control of it. 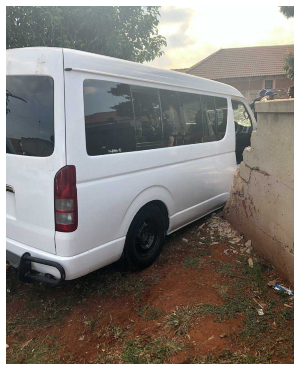 It came our way and we tried to react but it was too late” the taxi slammed into the group dragging Themba along before pinning him to a wall while it pushed Thokozani through the wall before coming to a stop. “It pushed me into the yard through the wall and I thought I was the only one injured until I saw Themba” he says. For Themba this ordeal is one which he feels has robbed him of something special. He has had to go through two surgeries already to try and reconnect his bones and still has one more procedures to go. Even with the best outcomes predicted for his prognosis he will never return to his old self again and his recovery is said to take two years at least. The spokesperson for the Vosloorus police station Captain Piet Rossouw said, "I can confirm that a case of reckless and negligent driving has been opened against the taxi driver and that the matter is still under investigation. His statement has been taken and as soon as investigation is complete the case will go to court."